We've started preparing for the forthcoming season; a general tidy up, and replacement and installation of 2 tanks. We had a tank attached to the males pond system that we called the 'tea cup'; it was shaped like a tea cup and provided a useful holding tank for fish that we selected out to move on. Thing was, that the sloping shape of the sides meant fish had a tendency to jump out. Very annoying for us, and probably even more so for the fish. It's been on my mind to replace it for years, and finally it's risen high enough up the priority list for us to make the change. I bought a job lot of plastic tanks - some of which we'll use on the breeding and rearing side of things, one will become a dedicated quarantine tank and will be sited outside the polytunnel. The other one is being used to replace the tea cup tank. The new tanks are made from sturdy plastic, and measure in at 7ft diameter, and 4 ft deep. This is the one we used to replace the tea cup tank with; and we've also replaced the pallets that were used as standing platforms with some paving. That's still work in progress - but it will be an improvement to the area around the males tank. The tank is a direct swap out for the tea cup tank, and is plumbed into the males tank filtration. I've gone with a 2 inch bottom drain, and John Steven was over last weekend to help finish it off. Last Sunday, Amanda and I moved the nissai we want to sell into this tank - these were the nissai we selected out to sell during the course of last summer, but never got around to actually selling. They've been overwintering in the males tank and females tank, and are looking very comfortable in their new tank where they can stay for as long as necessary, and be out of the way of preparing the males and females for spawning in a few months. One of the tanks will be plumbed into the growing on system. This provides a 4th tank on the growing on system's existing filtration and heating. The idea is to have the 4th tank and the green vortex connected up to the system from spring through to autumn - where the air temp is high enough for the air source heat pumps to cope with the increased water volume. I'll use the new tank to spawn in, which is a format I tested last year quite successfully. Later in the year, given some successful spawnings, it will also provide me with another tank where we can hold 1 inch fry while they are waiting to be selected - therefore removing the need for me to hold them in cage nets which will be much better for me, and the fish. Layout out the celotex that the new tank will sit on, and channeling out areas for the bottom drain and waste pipe. We'll set one up outside the polytunnel, and use it as a quarantine system. After making the breeding side of things so much harder last year, with having the complexity of bringing fish back from shows and dealing with the post show treatment.... it caused so much trouble last year, that this year, we contemplated not showing at at all to give us our best chance on the breeding side. But with showing our home bred koi the fundamental reason for this whole project - the quarantine system is the solution. so fish returning from shows will spend some time in the QT. that should help a lot. The other 3 tanks will be stand alone tanks that I'll use this year to try out artificial rearing of new hatchlings. My main target this year is to rear a much higher number of fry to first selection size from a single spawning - Bear in mind that the best we've achieved is around 25k; I've set a stretch target of 100k. 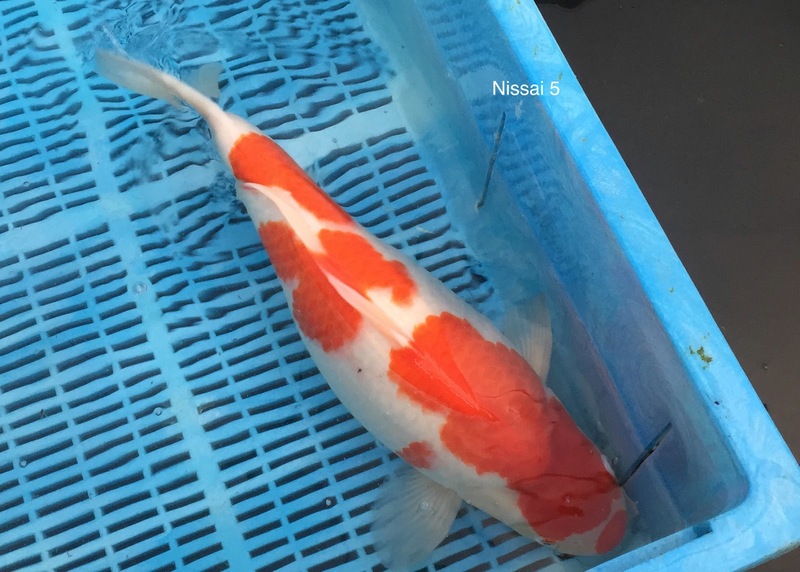 I think that along with improving my brood set genetics, the larger scale is necessary to have more fish of high enough quality to compete at koi shows, and I'd really like to be competing at the middle sizes as well as the smaller sizes and simple maths states that the more fish I have at first selection , the more there will be of the 1 in 1000 fish, and 1 in 10,000 fish that I need for exhibiting at koi shows. And I may find the odd 1 in 50,000 fish that I haven't yet seen the quality of... and that could be exciting. Oh, one more thing before I conclude - some good news. Nissai 5, growing on over the winter - was sporting an unfortunate shimmi when we photographed it on November; I'd planned to give it a good scrape to see if it would come off, but on closer inspection - it's actually pigment in the skin and I just left it as it was. here's the pic from November last year and you can see the black spot on it's back. Well, observing it in the tank recently - the spot has been decreasing in size, and I think it's actually dissappeared all together. really happy about that!